Jazz Saxophonist Frank Fontaine releases his first Album, Wisdom Rising (LifeForce Jazz Records) to the acclaim of becoming an iTunes “Rising Stars of Jazz”. The East Los Angeles-born reed man assembles a superior cast of playmates �” John Beasley, Robert Hurst, Marvin “Smitty” Smith, for this live studio recording captured direct to track, with no overdubs. Together they make music informed by the rhythms of Fontaine's Hispanic culture, while also going beyond into adventurous (odd-metered) modern jazz. In the process, Frank evinces a versatility rare among young players; his compositions and interactions with different combinations of group members underscore his collaborative instincts. Since his return to New York, Fontaine has increasingly become one most exciting and increasingly active woodwind artist on the scene in New York and beyond. He is currently a favorite among elite jazz instrumentalists such as Francisco Mela, Ari Hoenig, George Garzone and several of New York’s top Latin Bands such as Larry Harlow and Chembo Corniel. The collaboration with Chembo has most recently produced a Grammy Award Nomination for the album “Things I Wanted To Do”. Frank can frequently be seen with his Organ Trio or Quartet in some of New York's favorite Jazz Venues. 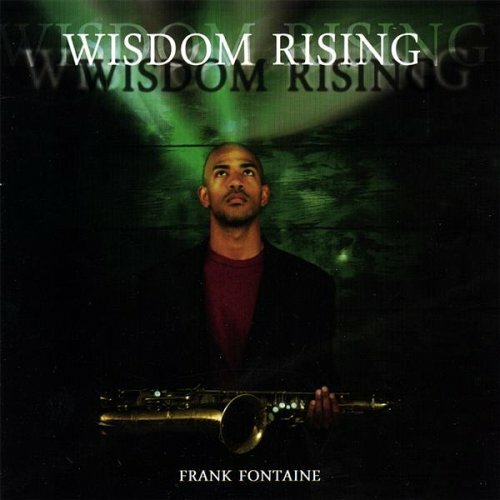 “Wisdom Rising” is the title of Frank Fontaine’s debut recording as a leader, Wisdom is thee most appropriate attribute that we can anoint this young man with. Frank is the Saxophonist of choice for an incredible array of artists - from the masters of the music to the hottest young players of today - and is equally in demand as a Flutist and arranger. Born in East Los Angeles California into a musical family, Frank absorbed a great deal from his father Frank Sr., who is a 10 veteran of the Duke Ellington Orchestra and is closely affiliated with many jazz greats such as Harry “Sweets” Edison, Frank Morgan, Freddie Hubbard and Mercer Ellington. By age 16, he was performing with Harry Sweets Edison, Billy Higgins and Kenny Burrell. Demonstrating his stylistic diversity, Frank is also featured (on multiple instruments) on recordings by Patti LaBelle, Tyler Perry’s Soundtracks, Gladys Knight, Celia Cruz, Bobby Matos, Anita Baker, Gym Class Heroes and The Latin-Grammy Nominated Charanga Cubana. Currently, while he continues to perform and record with a wide variety of artists, Fontaine leads this dynamic group of veterans all across the globe. Outside of his many touring and recording accomplishments, Frank continues to cultivate his musical prowess at The Manhattan School of Music, a conservatory second to none, in a city second to none. Wisdom Rising, a literal depiction of hard work and a metaphoric depiction of Frank Fontaine’s powerful career! Known internationally for his innovative spirit and broad musical palate, Frank has “punched the clock” with the small groups of Horace Silver, “Sweets” Edison, Elvin Jones and Spanky Wilson, a short roster to say the least. Frank finds himself at home on the stages of the world’s greatest jazz clubs and equally @ home in the company of the worlds biggest Pop Stars. Mariah Carey, Patti Labelle, Marc Antonio Solis, Anita Baker, Celia Cruz and many others are collaborators with Frank's talent. Still, Frank does not limit his musical pursuits to touring and live performance. His has participated in various film scores as composer, arranger and or a featured soloist. Sami McKenny and Patti LaBelle have insisted on Frank's production and sax work for years now. Such credits and success in the arranging business have made Frank one of the most sought after session producers in the field. Welcome the page for the musician you have already heard but didn't know it. All Levels...... I have maintained relationships with many students through grade school & into College. The MOST important "level" to me is the level of dedication that a student has to the learning process. All About Jazz musician pages are maintained by musicians, publicists and trusted members like you. Interested? Tell us why you would like to improve the Frank Fontaine musician page.